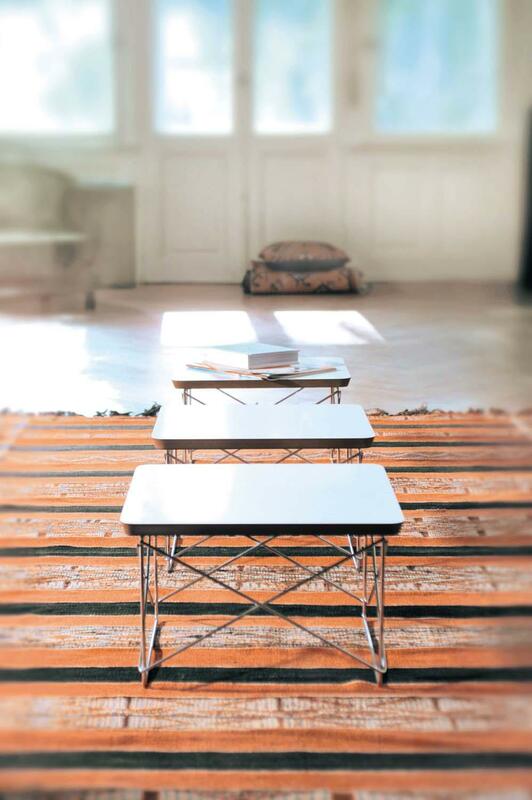 The Vitra LTR occasional table by Ray and Charles Eames is an endearing a timeless and stylish classic side tables. Created inin 1950 via a similar construction principle as the plastic chairs the base of the Eames LTR table is constructed from spot-welded steel wire, which is then combined with a plywood tabletop. The new version with black base and black table top was created within the Vitra Black Collection. Care The surface can be wiped with a soft, damp cloth. 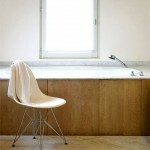 If necessary, use lukewarm water with a small amount of mild, neutral detergent. Is the LTR available in other colours? From time to time, the LTR is produced by Vitra in various special limited editions, all of which can be found in the smow shop. Does the gold leaf version have a flat upper surface? Yes, the surface is sealed with clear lacquer and smooth. The individual gold leaves are however visible. 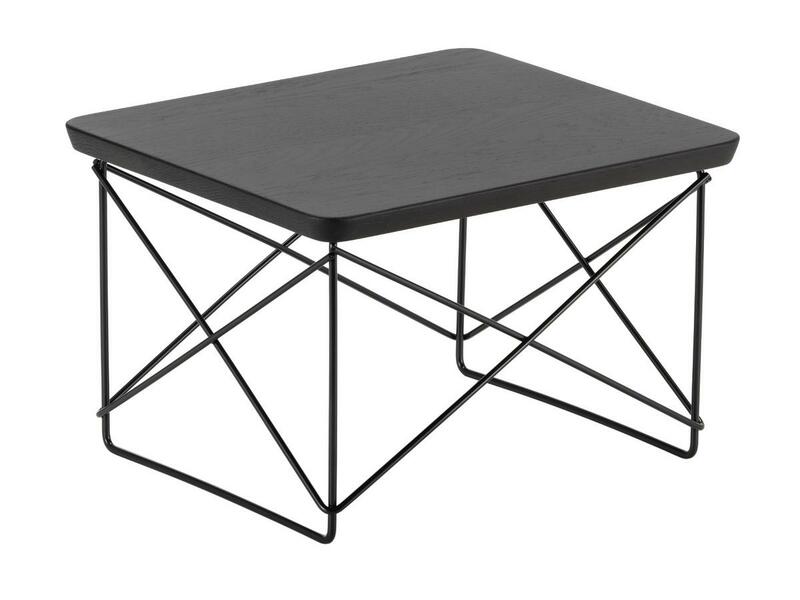 When Charles and Ray Eames designed their LTR Occasional Table in 1950, they used a concept that they had developed earlier that year for their plastic chairs collection: a frame constructed from spot-welded steel wire. 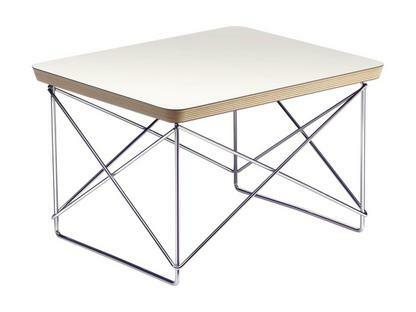 Consequently the table top is not supported by the classic four legs, rather, the base of the Vitra Eames occasional table is a braid covering the entire area under the table top, a construction vaguely reminiscent of the of the Eiffel Tower. Vaguely.As such the design of the Eames LTR tables stands very much in the tradition of an organic form language, for all as expressed by the infinite nature of the base and its neatly rounded corners. 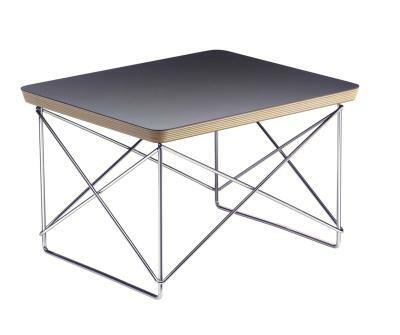 The innovative LTR table base provides a combination of stability and optical charm with physical ease and like all Eames furniture the occasional table is characterized by an accessible design that is simple and functional as well as stylish and timeless. Charles and Ray Eames used the occasional tables in their home in Pacific Palisades, Los Angeles where they served as both side tables - individually or in groups - and informal, low level shelving. The exclusive license for the production of the original Eames occasional tables outside the USA is held by Vitra. Based in Birsfelden, Switzerland, and Weil am Rhein, Germany, Vitra have worked with the Eames and Eames designs since they acquired in 1957 the licenses from the original US manufacturer Herman Miller. 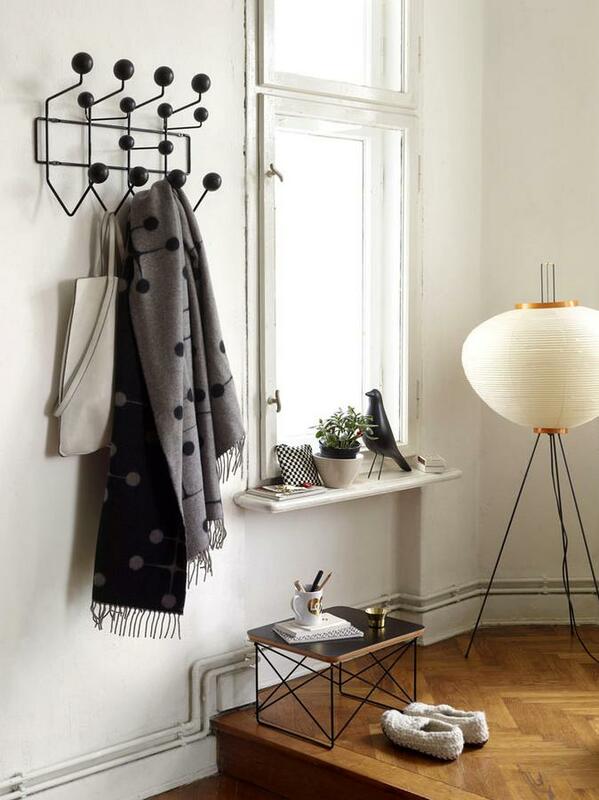 The Vitra LTR consists of a base in chrome plated steel wire and a laminated plywood panel top in black, white or with a clear varnished gold leaf surface. 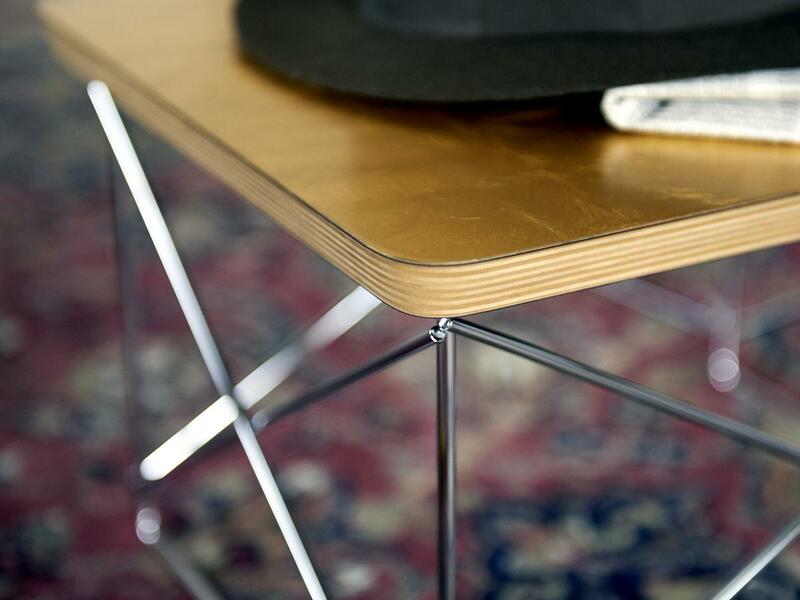 Following the abbreviation system developed for the Eames plastic chairs LTR stands for Low Table Rod base: the same rod base as found in the Eames DSR and DAR chairs. Charles and Ray Eames met in 1940 at the Cranbrook Academy of Art: Charles Eames and Eero Saarinen were working on their preparations for the MoMA New York's "Organic Furniture Competition" and painting student Ray Kaiser Berenice was assigned to assisted. 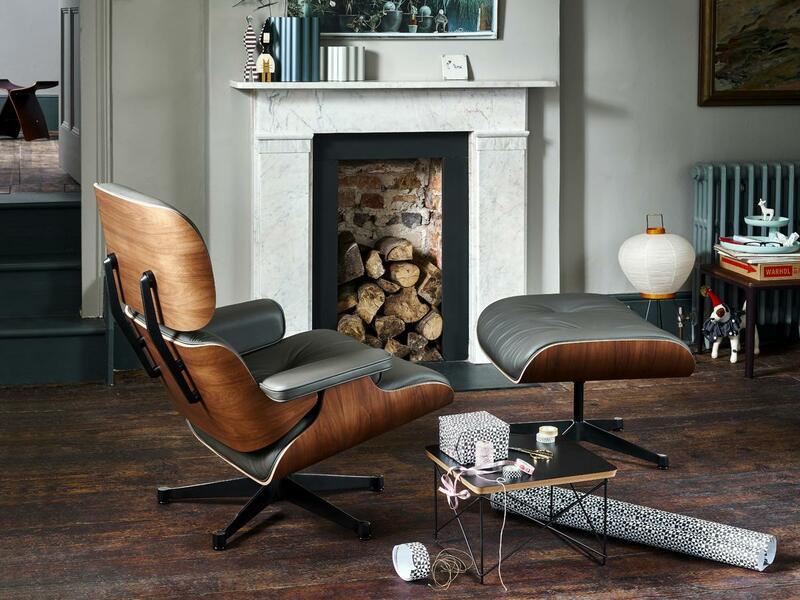 A year later it was the pair married and from the early 1950s all designs from their Eames Studio were attributed to Charles & Ray Eames. 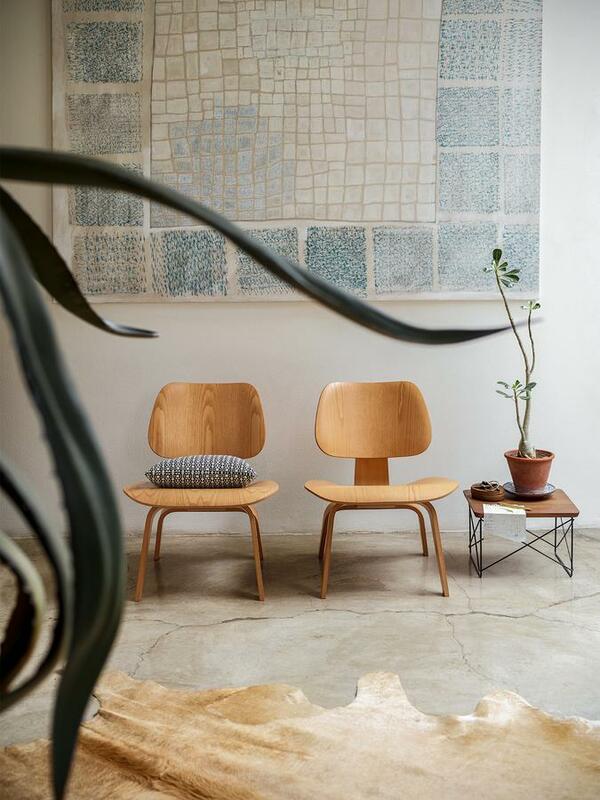 From their Los Angeles studio emerged, alongside popular furniture designs such as the LTR occasional tables, various chairs the Eames Hang it all, numerous photography, textiles, graphic and film projects. Charles and Ray Eames complemented each other in their work insofar as the architect Charles was responsible for the design and technical aspects, while the painter Ray took over the aesthetic and graphic elements. Since Ray Eames' death in 1988 the Eames House in Pacific Palisadeshas remained unchanged and so visitors can experience not only the Eames' approach to architecture and interior design but also the complete oeuvre of designers. 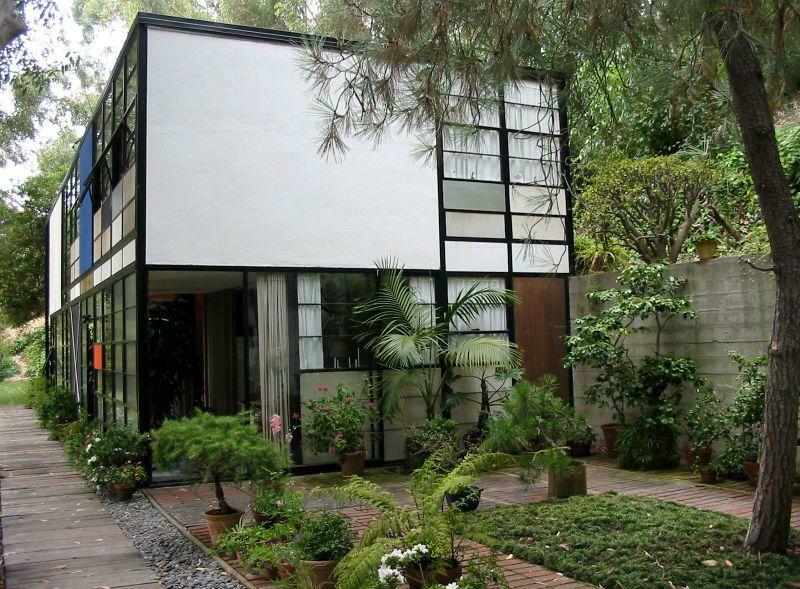 In 2006 the Eames House was added to the list of National Historic Landmarks and the National Register of Historic Places. In the years before the outbreak of the Second World War Willi Fehlbaum opened a shop fitting company in Birsfelden, Switzerland, which in 1950 he renamed Vitra - and relocated a few kilometres down the road, and over the German border, to Weil am Rhein. With the discovery of an Eames chair on a trip to the USA in 1953 Willi Fehlbaum decided to seek permission to make the furniture in Europe. Permission which was granted and which still influences the Vitra company philosophy and portfolio: objects such as the occasional table, aluminium chairs collection and Eames Elephant building prominent cornerstone of the outstanding Vitra range. In addition to the Charles and Ray Eames Vitra also promote a large roster of international designers both established and establishing while with the Vitra Campus in Weil am Rhein offers, a unique collection of contemporary architectural works. 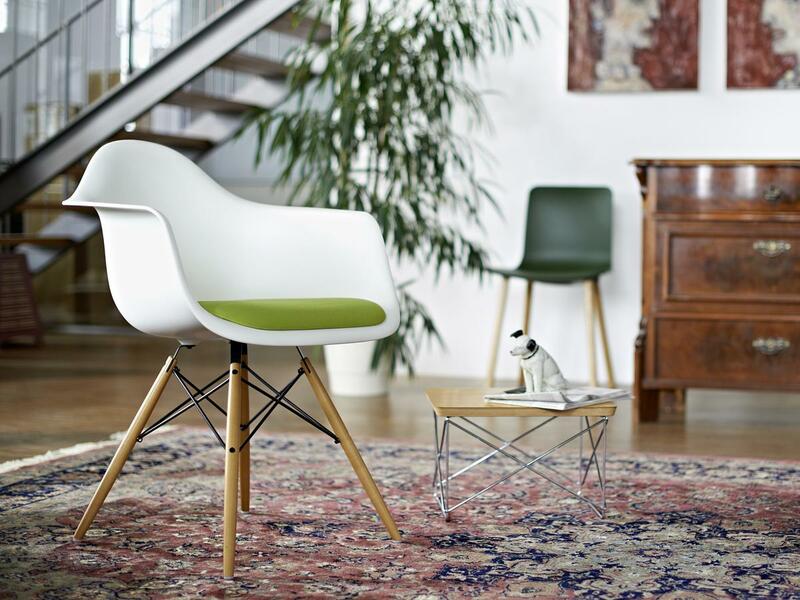 In addition to Vitra Home Collection Vitra is also a recognised manufacturer of revolutionary office furniture. 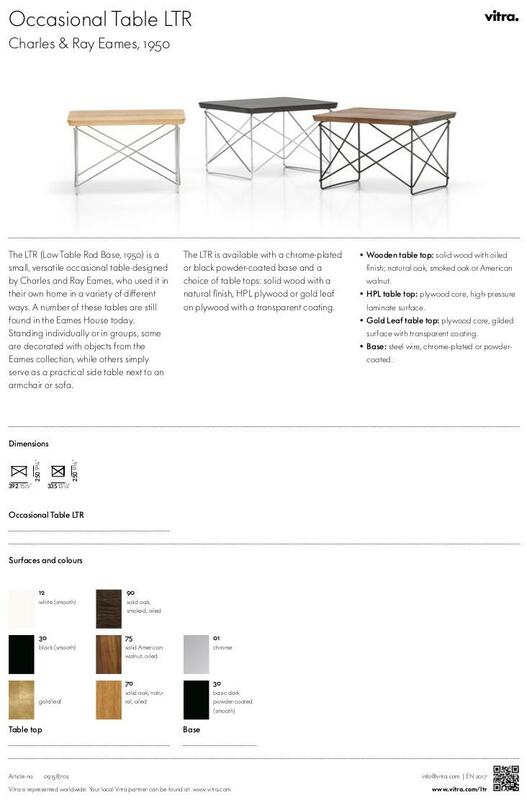 In 1950 as Charles and Ray Eames designed their LTR occasional table, design and architecture were heavily under the influence of the second modernity. Following the Second World War enforced interrupted the modernism, a movement popularly represented by the German Bauhaus school, the functionalist approach was taken up once again with enthusiasm and gusto. Under the influence of technical innovations, especially those related to the new possibilities of mass production, new standards were set in furniture design. 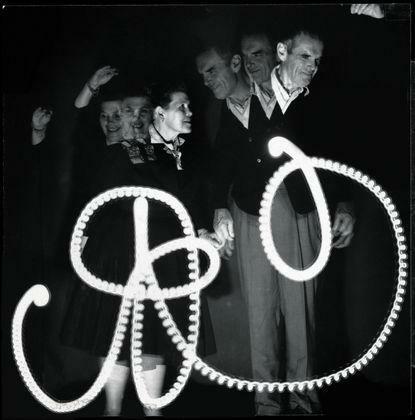 Charles and Ray Eames expertly utilised the opportunities presented to create new products true to their motto of "The most of the best to the greatest number of people for the least" and thus created a canon of work which made good design affordable to the masses and thus fully met the spirit of the post-war society. After years of deprivation consumerism was once again coveted and soon an indispensable part of social life, and something in which all were invited to participate. The designs of the time were functional and exhibited, in contrast to European modernism, a particularly organic design language, as beautifully demonstrated by the seemingly endless base and the rounded corners of the Eames LTR table.